There have recently been calls to pardon the last woman imprisoned in England under the Witchcraft laws. Her name was Helen Duncan and she was a psychic medium. The details of her life and the case brought against her were the subject of a talk at Assap’s Seriously Suspicious conference on conspiracies on Saturday. 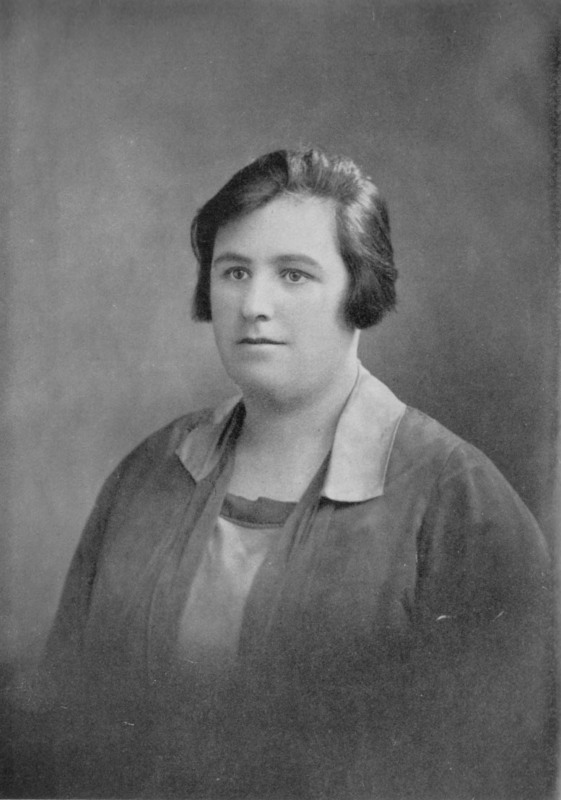 Helen Duncan (pictured top right) was born in 1898 and she was a psychic medium – a clairvoyant. She was part of an elite group of mediums - physical mediums. They can affect physical world with things like raps on tables, making objects move and manifesting physical forms, which is what Helen did. 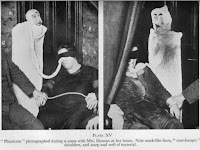 Witnesses described seeing ectoplasm, which is a white substance that resembles shapes of people who have died; spirits. She became one of the most famous in world and travelled all over UK, visiting Spiritualist halls and private homes etc. 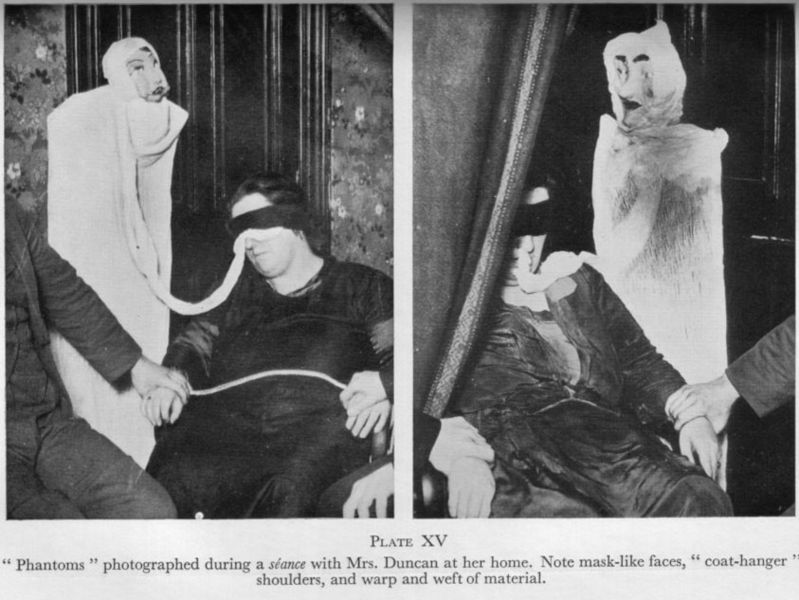 There are two photos (left) that are obvious fakes with papier mache dummies, sheets and coat hangers. People say these prove she was a fraud, but there is always more than one side to each story. Yes, these are fakes, but were intended as a reconstruction of what Helen Duncan in trance would look like. Helen operated in an unusual manner to other mediums. There would be rows of seats for sitters, you paid 12s at the door - not cheap - sitters would sit in front of stage, which had a cabinet/cubicle with a seat. Helen Duncan would prepare in another room. It was important to her that people believed her. She would strip and a nurse would check her to say she wasn’t hiding props and also invite female members of the audience to watch the body search. Then she would move into the cubicle, curtains were drawn and the room was lit by a low-power red bulb. That lighting could be said to hide tricks, but proponents of this said it was done to protect the spirits, which were harmed by bright light. In 1939 when World War Two broke out, Helen’s fortunes changed. Her services were required. People were very frightened and uncertain. Her business boomed. But, on 25 may 1941, things went wrong. Her spirit guide appeared – one was a man called Albert, an Australian, and another was a young girl called Peggy. At this séance Albert said a British battle ship has just been sunk and that he had 1,400 of her officers with him in spirit. One man in the audience, Brigadier Firebrace, was head of army intelligence in Scotland as well as being a paranormal researcher. He went to his office and checked with a phone call. Initially the reply was no, everything was fine. Then he got a phone call saying that HMS Hood had gone down off Scapa Flow and 1,400 were dead at the time Helen did her séance. The loss was a major blow to war effort. Because Brigadier Firebrace had a belief in paranormal and he realised Helen was getting war information from the dead and could possibly reveal classified information, he was worried. His daughter has a letter that he wrote saying there should be intelligence monitoring of Helen. She carried on her tour. 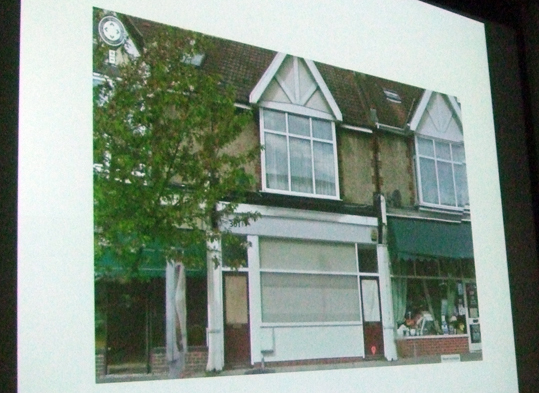 On 24 Nov she was doing a séance in the Master Temple in Portsmouth, which was actually a small room above a chemist’s shop run by Mr and Mrs Homer (modern photo right). Albert said another battle ship had sunk and hundreds of officers were in the spirit world. There were probably intelligence agents in room watching. What made it worrying was that the government had decided to keep the sinking of HMS Barham quiet. It was just after Dunkirk and morale was a major concern. Even some relatives were not informed and secrecy was high, so it is unlikely that Helen had found out by normal means. She carried on, but she was probably monitored - maybe by enemy agents too. Nothing more was done for three years. She was arrested 19 Jan 1944 in the Master Temple in Portsmouth. She had a conviction for fraud from several years earlier and in that instance she had been fined. This time, instead of getting a fine, she got something totally unexpected and the case escalated. She was taken to the Old Bailey and charged under the Witchcraft Act of 1735, which was about pretending to use witchcraft or sorcery, or pretending to do any occult science. It was almost first sceptic law as it said that people who claimed to have psychic powers were pretending. It was not common to use this old law by the 1940s. The Witchcraft Act was on the verge of being repealed. However, the judge sentenced her to nine months in prison. A look behind the original news stories offers a chance to find out what happened. The trial became media sensation and even war stories were second paged. John Cyril Maude KC prosecuted the case in courtroom 4 of the Old Bailey. Helen had not been given bail – she was a remand prisoner. He was a member of one of the Inns of Court, a senior member, and after he convicted her he was knighted and became an MP. Is this a coincidence? Sir John Cyril Maude was dealing with two cases. Also, in court 1, he was prosecuting a case of a man on trial for murder in Portsmouth – the Portsmouth chief constable was a witness in both trials. The murder suspect said he was framed and was acquitted. Maybe the government wanted Maude because he was a wartime intelligence operative charged with tracking sources of rumours. The office he was in would have been employed to keep an eye on Helen. The presiding judge was also a senior naval officer, so would have been emotionally involved in the case. There is also a letter specifically asking for Maude to preside over prosecuting the case. One of the most recent books about the case is called Helen Duncan the Mystery Show Trial, by Hartley 2007. It offers evidence that there was a conspiracy to imprison Helen. It looks as though there was a secret cabal that included Commander Ian Fleming. He was a naval intelligence officer, a member of Society for Psychical Research, an occultist and, of course, wrote the James Bond novels. There were difference in the way the witnesses for the prosecution and defence reported the events. Prosecution witnesses said they were lured there and saw Helen in a sheet. Two people were put there by the police and said they pulled a sheet off and blew a police whistle. One of them said he was motivated to do that because he was disillusioned by seeing Helen was a fake. He lied under oath. The defence council asked him if he was a member of the intelligence services. He said no, but he was. The bed sheet should have been a major exhibit in court, but it wasn’t. It got lost – even though two people said they had their hands on it in the police raid. There were discrepancies in the details of how it got lost. There were contradictions in how low the lights were and whether faces were recognisable. Harry Price, the paranormal investigator, coached the prosecution’s witnesses. The jury found her guilty in half an hour and she was taken to Holloway Prison. One hypothesis is that she was a real psychic medium or people in government thought she was and constructed a conspiracy to put her in jail because of D-Day, which was being kept very secret. All it took for the secret to come out was if in one of Helen’s séances something came out. However, why didn’t the government pay Helen off or make her sign the Official Secrets Act? After she was released, Helen returned to mediumship and the Witchcraft Act was eventually repealed. Ben, thanks for giving the talk - very interesting.